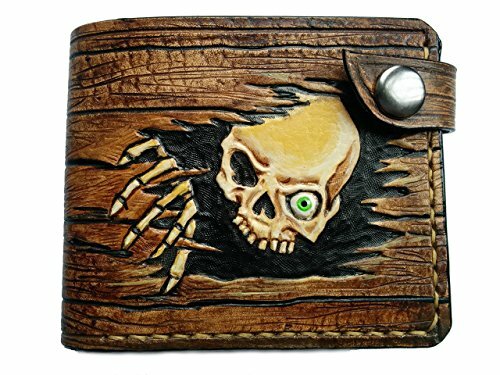 Gorgeous men's leather handmade wallet with hand-tooled and hand-painted image of a skull. Our wallets are made out of high quality veg tanned leather. The design was performed using embossing and staining techniques. It is delicated work , which was painted with qualitative paints and protected with a clear water-based finish. Our products are carefully constructed by hand, so special attention is paid to each stage of the manufacturing process. The edges are hand smoothed, rounded polished and painted. The inside is made of high quality genuine pigskin. Inside a roomy compartment for bills, several pockets for cards, a large horizontal pocket and a compartment for coins with a snap. Beautiful and at the same time practical, durable and convenient accessory which will serve and delight you for many years or your friend if you decide to make a present. We accept personal orders, your initials or your logo can be hand-painted on the wallet. We have two options for the inside of the wallet. First: with a coins pocket, Second: without coins pocket. And you can choose an option to close your wallet, with or without a snap. Shipping: The order will be ready during 2 days after completing the purchase. You receive the items within 3-4 weeks. The item will be ship by Haypost Registered Airmail with Tracking Number. And please leave us your feedback and review on Amazon, as it is very important for us. If you have any questions about this product by Theodoros, contact us by completing and submitting the form below. If you are looking for a specif part number, please include it with your message.